Considered the most luxurious meal, the most prestigious in the world, Caviar conveys an image of exclusive quality. Taken from sturgeon, a predator among the species still alive, caviar is being already harvested in the world since more than 200 years. Today 90 % of wild sturgeon fishes are caught in the Caspian Sea. The southern part of Caspian has different characteristics contributing to the quality of caviar. The high quality of caviar will not only depend on ideal ecological sites, using the best fishing or marring methods, but also to the preparation method in Iran. The rigorous preparation and salting, without excluding traditional methods, are essential to the development of caviar quality to become what would be best in taste. 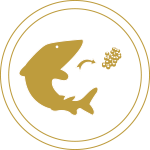 The caviar should be entrusted to our experts, who treat it with utmost care and hygiene… absolutely sterile, not to forget that it must be the product of first grade sturgeon in the first place. Upon landing, each fish is weighed washed and marked with a number which will be then noted on the caviar original tins for tracing back. After washing each sturgeon is opened by hand on a marble lab. An experienced expert carefully removes the roe and transfers it to a special bowl to be weighed before sorting. 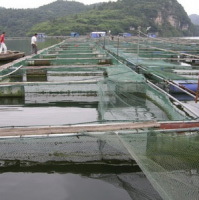 Everything done manually, the caviar is passed through a coarse strainer, to remove the skin and ovaries left-over. Then the caviar is transferred to a special container, rinsed again very carefully, ready to undergo the last manipulation stage: salting for conservation, depending on the grain and the consumer taste. For this stage, we utilize sea salt (according to our own recipe). Quantities are subject to constant monitoring. In fact, salting is the most delicate operation in caviar preparation, and only the optimal values will give satisfactory results. 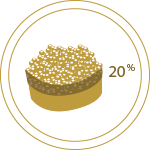 If the salt in caviar is too low, the caviar will rapidly deteriorate and if too high, it dries and becomes sticky. The art of the caviar grading can be found in the original tins. 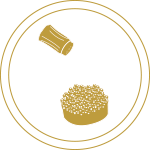 The absolute consistency of the grain, the caliber, the color, the aroma, flower, gloss, hardness and resistance of the skin are all factors needed to evaluate the caviar quality. Our experts carefully evaluate the quality and select only the best for sales. In addition for each grade they make a special selection. Filling the original tin might look boring to be described, however, in case of caviar it is well worth it. If this stage has still remained to be done manually and with utmost care, it means that this continues to be an indispensable method. Each original tin is filled to about 20 % above its capacity. Then they carefully positions the cover and press it down with edges overlapping the tin, which will form a partial vacuum inside, by pressing out the excess liquid. Then the rubber band is placed around the edge of cover. A very dry edge means the caviar is too old or improperly stored. 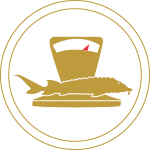 Fresh caviar usually comes in 1,8 kg (4 lBS) or 1 kg metallic original tins with a guarantee of one year conservation if properly stored. Each original tin is unique and the markings on that attest its authenticity. The original tins are packed in individual bags, which in turn are put in export boxes for shipment to destinations.